Hezbollah ("Party of God") is a Lebanese Shia group. Though sometimes mistaken for Palestinians – most of whom belong to the Sunni sect of Islam – they are genuine Lebanese. The Shia also have another group in Lebanon, called El-Amal. I saw a Hezbollah flag on television. It was yellow with in the center name Hezbollah (God's party) in Arab writing (Kufi style). Around the name were several revolutionary symbols, including guns. The flag of Hezbollah is yellow with a green device (probably a Kalashnikov, a book and an Arabic inscription) in the centre near the bottom. The flag is green-fringed. 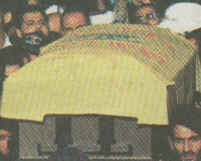 In the Israeli newspaper Yediot Akhronot of 18th August 1999, a photo taken at the funeral of one of the Hizbullah leaders in Lebanon shows their flag with an (apparently multicoloured) logo on a yellow field on the coffin and hoisted. This flag [also] exists but I believe that with green logo is the official one. The highly stylized inscription comprising the base of the Hezbollah logo is "حزب الله". The upper text reads "فإن حزبالله هم الغالبون" (usual English transcription: "fāʾinna ḥizb allāh hum al-ġālibūn"), meaning «Then surely the party of Allah are they that shall be triumphant», a Koranic quote (5:56), while the lower text reads "المقاومةالإسلامية في لبنان" (usual English transcription: "al-muqāwamah al-islāmīyah fīlubnān"), meaning «The Islamic Resistance in Lebanon». This is a reconstruction of a flag seen in a poster of Hezbollah' secretary general, Hassan Nasrallah. The flag is draped and behind him so take the included image [above] with many caveats. It appears to be the yellow version of the Hezbollah flag with the addition of a black band bordered with some sort of shiny golden material. Closer to the edges there is a green border. Only part of the writting on the black band can be seen (which I have attempted to copy) but it seem to go all around. The lettering on this band is golden (shiny) and the one on the logo is green. Vidcaps with a similar flag (slightly different ratio, it seems to me) can be seen here and here. Interestingly, I have found what appears to be a variant (minus the gold and green band) here. Unfortunately, no indication of its use. 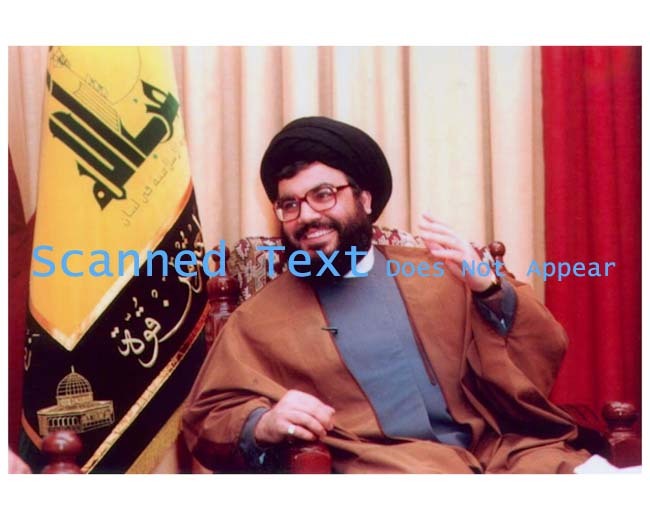 Many viewers were confused after watching the televised speech of Hezbollah Secretary General Hasan Nasrallah, which aired on the evening of 9 July 2006, where the traditional Hezbollah flag that appeared behind him next to the Lebanese flag seemed altered. The black part at the bottom of the flag caught viewers' attention as it had inscribed on it the Koranic verse: "Prepare for them whatever forces you can muster" (Koran, Ch 8, Verse 60). Some assumed the alteration was connected to the fact that Hezbollah is in a state of war, and linked between it and the change that occurred in the Iraqi flag in the wake of the Gulf War in 1991, when the words "God is great" were added to the flag between its three stars. Many people considered it an attempt by the (then) president Saddam Hussein to win the sympathy of the Muslim world. However, that case does not apply to the Hezbollah flag according to Lebanese MP Hasan Fadlallah, or Hezbollah's media advisor Hussein Rahhal. In a statement, Rahhal said Hezbollah's flag has not changed, and the verse "Prepare for them whatever forces you can muster" has in fact been on the flag for a long time. He said the flag that appeared in the recording (of Nasrallah's 9 August speech) is the official flag of Hezbollah's, and that the yellow flags that are carried by demonstrators or Hezbollah supporters and which do not contain that verse are incomplete and unofficial flags. A source connected with Hezbollah stated to that "the deliberate showing of that verse on Hezbollah's flag could mean preparation for or paving the way for the declaration of holy jihad against the Israelis. That (holy jihad) is usually declared by the al-waliy al-faqih (the ruling jurisconsult; the jurisconsult charged with authority) who in Hezbollah's view is at present (the Supreme Guide of the Iranian revolution) Imam (Ali) Khamenei who sometime ago had expressed his dissatisfaction at the silence of the Muslim World on what is taking place in Lebanon." On his part, Rahhal denied the possibility of this analysis being correct in part and parcel. So the writting going all around the flag might simply be the same Koranic verse repeated 4 times. Here is a poster of the leader of Hezbollah. 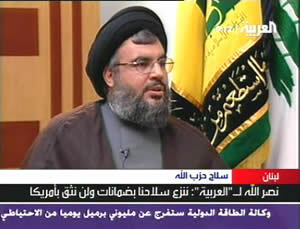 Alongside him you should also be able to see what appears to be possibly the "presidential flag of Hezbollah." It is the basic yellow Hezbollah flag, but with a black border with writings in Arabic and the "Dome of the Rock" in Jerusalem. Ma'ariv newspaper of 23 May 2000 showed more variants of the Hezbollah flag as seen at a parade the previous day: white on red, red on yellow, yellow on black and green on yellow. I saw on television the following variations of the more usual Hezbollah flag (green logo on a yellow field). Green logo on yellow, red logo on yellow, yellow logo on red, yellow (rather gold-ish) logo on purple (this one I seem to recall with a gold fringe). 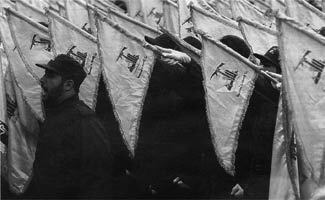 A black and white picture in the article shows a square Hezbollah flag. Shape and colours of Hezbollah flag do not seem to be really standardized. Pendant ma visite en avril 2001 j'ai (...) traversé la vallée de la Bekaa dans l'est du Liban. Partout des drapeaux étaient attachés aux poteaux le long des routes, aux fenêtres, en guirnalde à traves les rues. Il s'agissait de drapeaux du Hezbollah, il y en avait de toutes les couleurs: V/Y, N/R, W/N, W/R, V/N (...). During my trip in April 2001 (...) I travelled across the Bekaa valley in Eastern Lebanon. Everywhere there were Hizbullah flags tied to the [electric] poles along the roads, on the windows, to strings over the streets. Those flag had several colours: Green/Yellow, Black/Red, White/Black, White/Red, Green/Black. 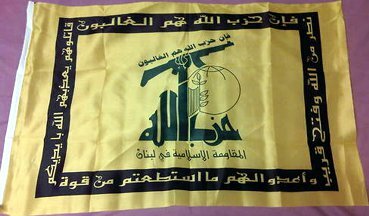 A different Hezbollah flag, used in 1994 in southern Lebanon. It is unusual in that the basic Hezbollah logo appears inside a frame. "On Sunday, 15,000 Quebecers, mostly Lebanese-Canadians, marched for 'justice and peace' in Lebanon." Including a photo of a new Hezbollah variant, with two busts of Hassan Nasrallah flanking the logo. [Gaceta de Banderas, January 2002, contains images of Lebanese political parties, reported by Michel Lupant and drawn by Jorge Hurtado following his specifications. (...) The flag of Hezbollah shows the emblem off-centred towards the fly and the flag's proportions are 7:8. Michel Lupant actually brought these flags home for his collection, and showed them to us at the October 2001 meeting of the Deutsche Gesellschaft für Flaggenkunde. I took pictures of these flags. (...) Looking at this flag more closely, I would say that the fact that the emblem is very offcentred towards the fly and the flag is almost square (7:8), is due to this being a quite used and worn specimen. Hoist as well as fly side look as if simply cut there without properly sewing the edge. So I would bet this is only part of the original flag. Assuming the distance to the fly was originally (i.e. before being deteriorated through use) the same as to the hoist, the resulting image is almost exactly 2:3, so probably this was the original intended ratio. One odd point: Yellow is used by Hezbollah as well – and yet is not a "Pan-Arab" color! The other Hezbollah flags that I have seen have been with yellow cloth, and either black or green wording. This one has the Hezbollah verbiage in Orange color – this somehow identifies some mysterious Hezbollah "Orange faction" – but I know nothing more about it. I am still investigating. Typical flag, but has a black border with some "slogan" -- not sure, could be the basic Islamic 'shahada'. I found a flag that is from the Middle East and I don't know which country its from. A friend of mine thinks it's a Hezbollah flag. Interesting. The logo is very close to Hezbollah logo but without its name. The inscription is in Arabic script but not in Arabic: "Safat Fasdaran Inkelab Islami." The year is 1257 (Islamic calendar). This is Farsi. I believe the correct transliteration is probably "Sepah-e Pasdaran-e Inqilab-e Islami," which is Farsi for "Islamic Revolutionary Guards Corps." Interesting similarity in the logo, since the US has charged for years that Hezbollah is controlled by the IRGC and Iran has insisted it's an indigenous Lebanese political party. I can't remember seing anything like this photo: a triangular version of the flag of Hezbollah. I saw these flags in a photo in the Público newspaper of August 15, 2006, during the Israeli invasion of southern Lebanon. They are in the shape of a right triangle, fringed, with the well-known Hezbollah symbol heavily shifted to the hoist, and seem to be attached to small hand-held batons, used in a (para-? )military parade. There is an extra line of writing below the symbol. This writing is the reason why I don't GIF, along with the impossibility of being sure about the colours: there's a high probability that the flag itself is yellow, but the charges may be green or black. I'm inclined for the first, but I'm far from sure. My guess as to what this is? A unit flag, or something of the sort. I recently saw a TV report on a Shi'ite youth movement sponsored by Hezbollah, the "Imam al-Mahdi Scouts." The flag was shown: yellow – naturally – with a black outline logo centered on a fleur-de-lys. There were also several inscriptions that cannot be reproduced.